This is a Hawai‘i County Civil Defense Message for Saturday, May 19, 2018, at 11 p.m.
Hawaiian Volcano Observatory continues to monitor active flows. Flow front #1 has crossed Highway 137 at the 13-mile marker and has entered the ocean. Flow front #2 is approximately 400 Meters from Highway 137. Highway 137 is closed between Kamali‘i Road and Pohoiki Road. Kamali‘i Road is closed between Highway 130 and Highway 137. Residents in the area have been evacuated. All persons are asked to stay out of the area. The U.S. Geological Survey (USGS) announces that with ash eruptions occurring from Kīlauea’s summit this week, there is a threat of an even larger steam-driven violent explosion. Such an eruption could happen suddenly and send volcanic ash 20,000 feet into the air, threatening communities for miles. USGS and NOAA’s National Weather Service are working together to observe, model and warn the public of hazardous conditions. Here is where you can find the information you need to stay safe. While the ​USGS Hawai‘i Volcanoes Observatory​ is positioning staff to observe the volcano and best communicate its status and evolution, they rely heavily on the weather forecasts from NOAA. Wind forecasts, ​along with dispersion models such as HYSPLIT,​ are critical in understanding where sulphur dioxide (SO2) and particulate matter (PM2.5) will disperse from fissures and vents to ensure safety of USGS observers, emergency managers and the public. On Tuesday, May 15, 2018 the National Weather Service issued the first ever ashfall advisory for Hawai‘i. Forecasters will issue ashfall advisories and warnings when ashfall is a hazard. NOAA predicts where an ash plume will go and how much ash will accumulate using USGS’s ​Ash3d Volcanic Ash Dispersion Model​. 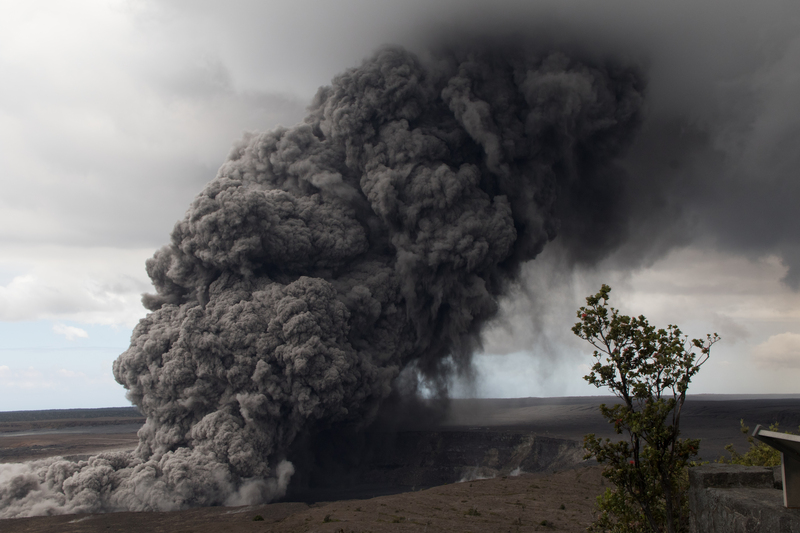 Volcanic ash clouds can threaten air traffic by sandblasting windscreens, clogging pitot tubes, and in severe cases, causing jet engines to shut down. NOAA issues volcanic ash warnings to alert pilots to potential ash in the atmosphere and will include volcanic ash in forecasts for airports. Protect electronics and cover air intakes and open water sources. Avoid driving as visibility will be reduced and roads may become slippery. Remain indoors to avoid inhaling ash particles unless it’s absolutely necessary to go outside. If you have a respiratory illness, do not go outside. If you must go outside, cover your mouth and nose with a mask or cloth. 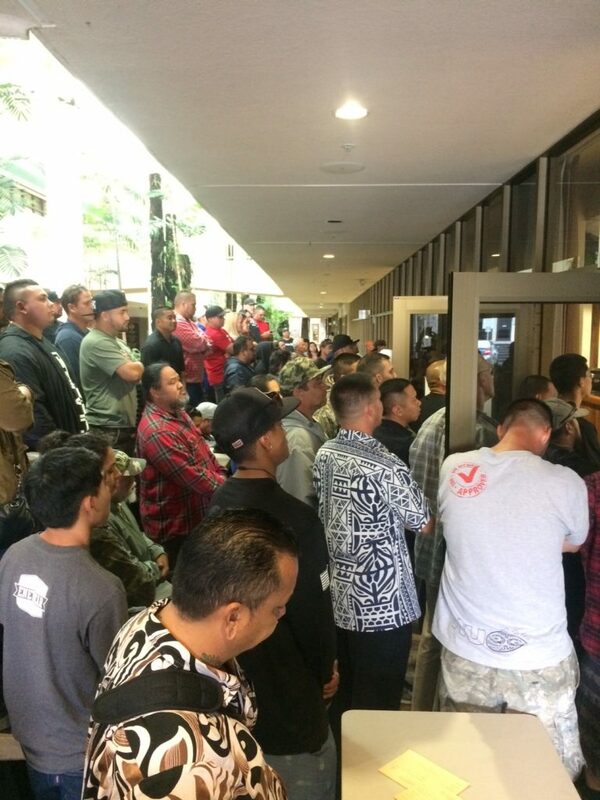 Hawai‘i Electric Light announces that all of Lanipuna Gardens and a portion of Leilani Estates has been designated as a no-entry zone for its crews. These areas are hazardous to enter due to continued ground swelling and cracking, sudden fissure activity, and unsafe levels of SO2. Crews were working in the subdivision in the last few days and have narrowly escaped situations that could have resulted in severe injury. Hawai‘i Electric Light’s priority continues to be safety and can no longer allow its employees to enter hazardous areas. Poles and wires continue to fall due to changes in the ground formation and seismic activity. 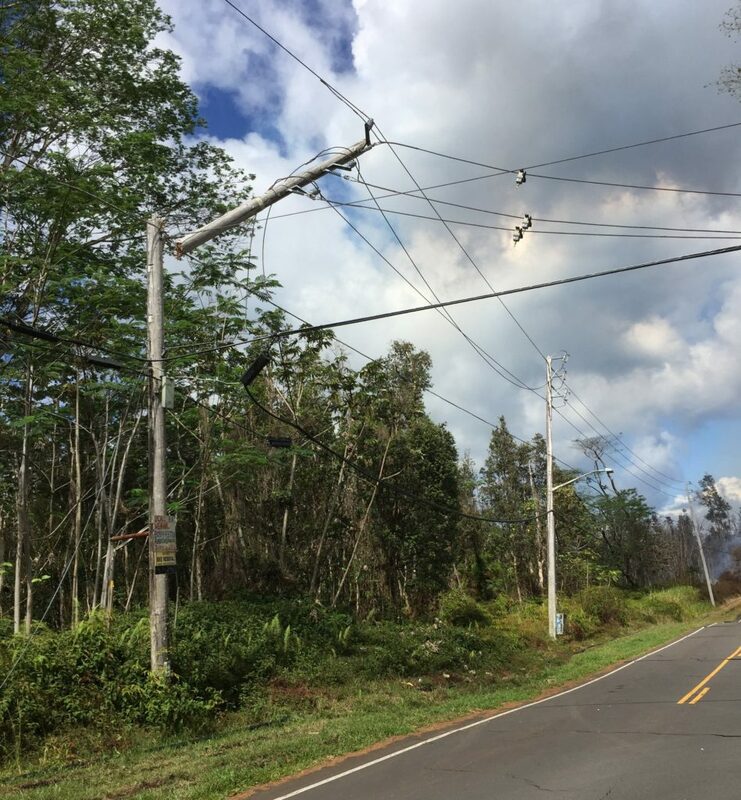 Hawai‘i Electric Light continues to warn residents to assume that all downed lines and equipment are energized and dangerous. Stay at least three cars lengths away from downed lines and use caution around all poles and overhead lines. The following areas are in the no-entry zone. This area may be extended. Check Hawai‘i Electric Light’s website (www.hawaiielectriclight.com), Twitter (@HIElectricLight), and Facebook (HawaiianElectric) accounts for updates. The United States Geological Survey reported that starting at about 2 p.m. on Monday, April 30, 2018, marked increases in seismicity and ground deformation indicated that a change was underway at Pu‘u ‘Ō‘ō on Kīlauea Volcano’s East Rift Zone. Visibility was nearly obscured due to poor weather conditions, but a brief clearing allowed Hawaiian Volocano Observatory’s webcam (POcam) to capture this image of the crater within Pu‘u ‘Ō‘ō shortly before the crater floor began collapsing. Unfortunately, due to ongoing poor weather, a clear view of the collapsed crater floor has not yet been possible. The Pu‘u ‘Ō‘ō crater floor continued to collapse for several hours yesterday; smaller drops in the crater floor have likely continued through today (May 1) based on thermal images. PC: USGS. A new crack about .6 miles long was found on the west (uprift) side of Pu‘u ‘Ō‘ō during HVO’s overflight today. The cracking appeared to be nearly continuous en echelon structures that were heavily steaming. A small amount of lava was apparently erupted from the crack, based on the presence of nearby tiny pads of lava and spatter, but it was no longer active when HVO geologists saw it during the overflight. This photo looks east, with Pu‘u ‘Ō‘ō obscured by low clouds in the upper left corner. PC: USGS. Telephoto view of a small lava flow (lighter in color) and spatter (blue-gray) that were erupted from a section of the crack on the west flank of Pu‘u ‘Ō‘ō. PC: USGS. Within hours of the Pu‘u ‘Ō‘ō crater floor collapse, HVO’s monitoring instruments recorded increased seismicity and ground deformation along Kīlauea Volcano’s East Rift Zone (ERZ) that continued through the night. These signals indicated an intrusion of magma from the Middle ERZ toward the Lower ERZ, extending from Pu‘u ‘Ō‘ō to at least Highway 130. 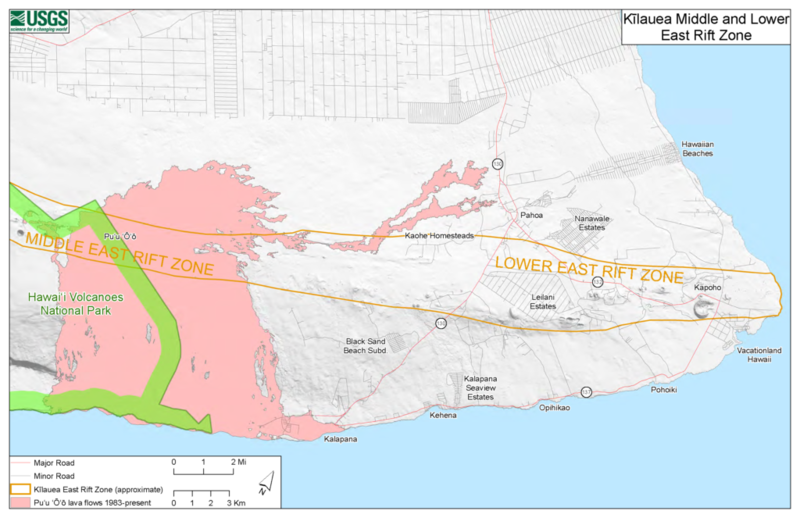 This illustration shows the approximate area of Kīlauea’s East Rift Zone, which, in reality, is not defined by distinct lines. MC: USGS. As of Tuesday, May 1, the eruption at the summit of Kīlauea has apparently not been affected by the collapse at Pu‘u ‘Ō‘ō or intrusion of magma along the volcano’s Lower East Rift Zone. 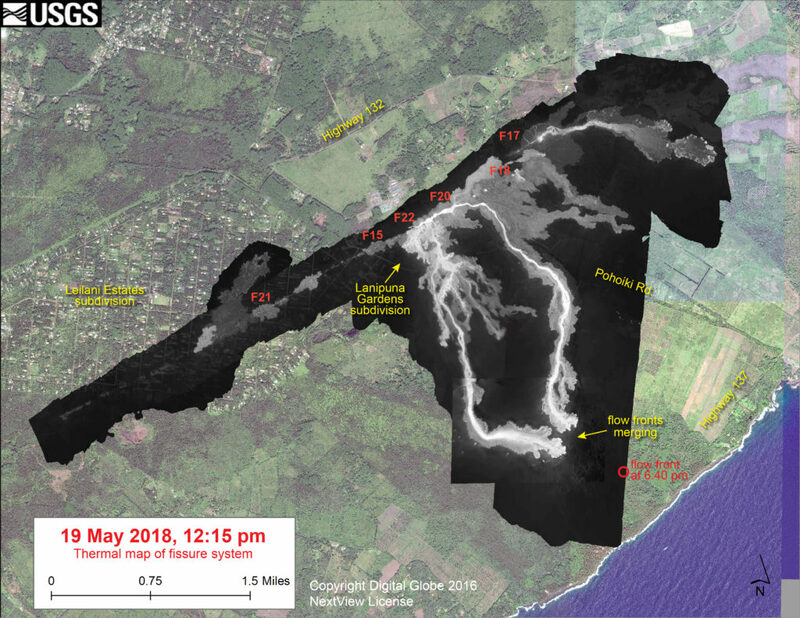 Following multiple overflows of the summit lava lake on April 21 and 27, which spilled lava onto the floor of Halema‘uma‘u, the lava lake level dropped over the weekend (April 28 and 29). But on the morning of April 30, the lava lake level began to rise in concert with summit inflation. This image of the summit lava lake was taken during HVO’s overflight just before 8 a.m. today, May 1, 2018. PC: USGS. VIDEO UPDATE 6: May 1, 2018, 12:50 p.m.
Hawai‘i County Civil Defense Administrator Talmadge Magno spoke to Big Island Now about the island’s recent seismic and lava activity. 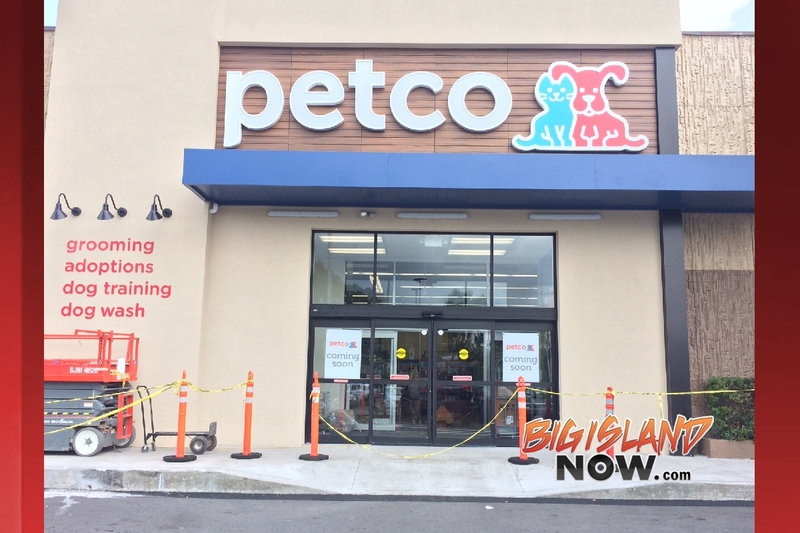 Seismicity and ground deformation started increasing at about 3 a.m. on Tuesday, May, 1, 2018, between Pu‘u ‘Ō’ō and Highway 130, and has now migrated beyond 130, he said. The East Rift runs underground from Kīlauea Summit at Halemaumau all the way down to the ocean at Cape Kumakahi. 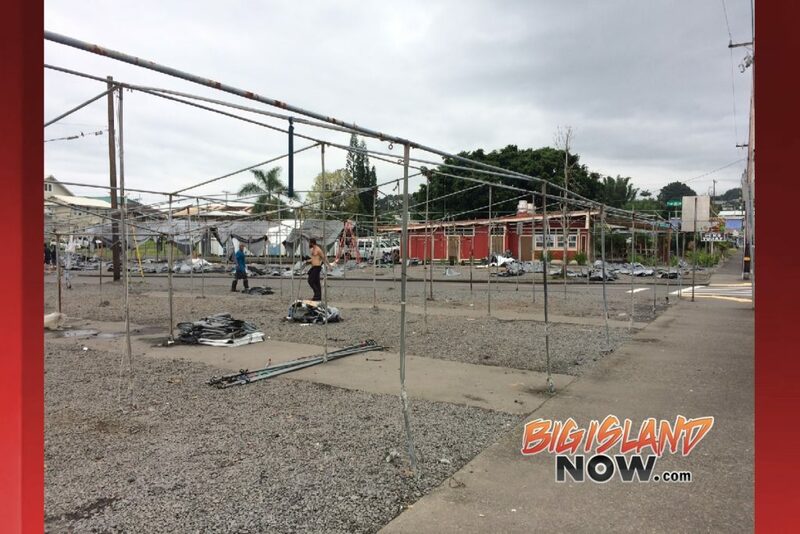 Magno asks Puna District residents to stay informed and encourages residents to sign up for civil defense messages and alert via text, email and RSS feed. 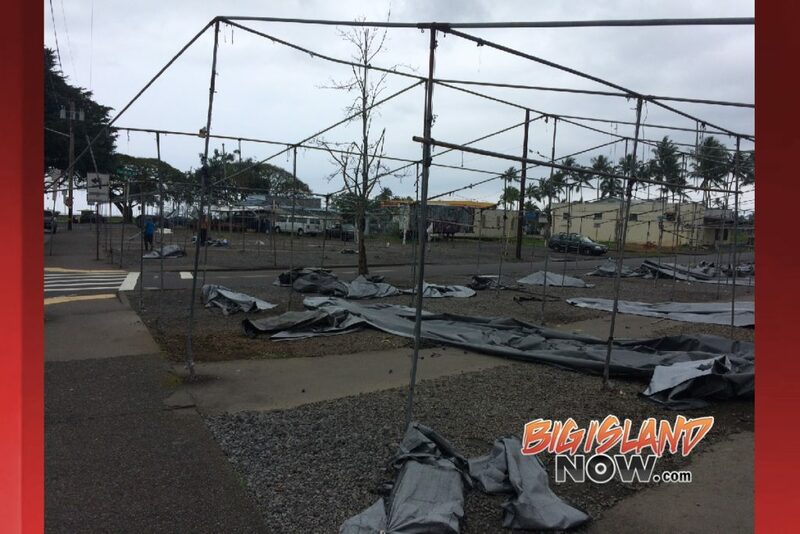 He advises Puna residents to prepare themselves—not just for this event—but for any natural disaster, with at least 14 days worth of supplies. 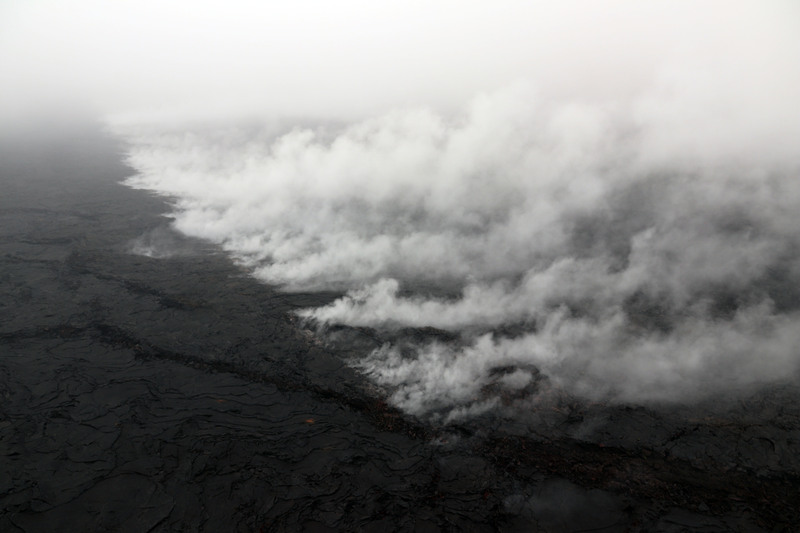 Magno warns visitors to stay off the Kalapana flow field, as a rift could open up any time above that area. UPDATE 5, May 1, 2018, 11:05 a.m.
Area residents felt the effects of the recent seismic and lava activity. “I got a Red Cross message this morning informing me of the deflation and saying [the quake was] 3 miles from Highway 130 and EOC (Emergency Operations Center) was activated at 5 a.m.,” said Keoni Delacruz Veloria, a Hilo resident. This map shows recent changes to Kīlauea’s East Rift Zone lava flow field. The area of the active flow field as of March 14, 2018, is shown in pink, while widening and advancement of the active flow as of April 13 is shown in red. Older Puʻu ʻŌʻō lava flows (1983–2016) are shown in gray. The yellow line is the trace of the active lava tubes. The Kamokuna ocean entry is inactive. The blue lines over the Puʻu ʻŌʻō flow field are steepest-descent paths calculated from a 2013 digital elevation model (DEM), while the blue lines on the rest of the map are steepest-descent paths calculated from a 1983 DEM (for calculation details, see http://pubs.usgs.gov/of/2007/1264/). Steepest-descent path analysis is based on the assumption that the DEM perfectly represents the Earth’s surface. DEMs, however, are not perfect, so the blue lines on this map can be used to infer only approximate flow paths. The base map is a partly transparent 1:24,000-scale USGS digital topographic map draped over the 1983 10-m DEM. UPDATE 4, May 1, from a report published by USGS HVO at 8:49 a.m.
Just after 2 p.m. HST today, April 30, 2018, a marked increase in seismicity and ground deformation (change in ground surface shape) began at Pu‘u ‘Ō’ō on Kīlauea Volcano’s East Rift Zone. A few minutes later, a thermal webcam (PTcam) located on the rim of the Pu‘u ‘Ō’ō crater showed the first of two episodes of crater floor collapse; the second collapse began at 3:20 p.m. and lasted about an hour. Webcam views into the crater and surrounding area were frequently obscured by poor weather conditions. However, shortly after 4 p.m., the PTcam recorded images that were likely the signature of small explosions from the western side of the crater as the floor collapsed. At the time of this update 6 p.m., April 30, there was no evidence of new lava within the crater, seismicity remained elevated in the vicinity of Pu’u ‘Ō’ō, and ground deformation at Pu’u ‘Ō’ō had significantly slowed. Kīlauea’s summit eruption has thus far not been affected by the afternoon’s activity at Pu‘u ‘Ō’ō. USGS Hawaiian Volcano Observatory scientists continue to closely monitor Kīlauea’s East Rift Zone and summit. A helicopter overflight of Pu’u ‘Ō’ō and the 61g flow field is scheduled for early Tuesday, weather permitting. HVO webcam images are posted online. Activity Summary: An intrusion of magma occurred overnight in the lower East Rift Zone extending from the general area of Puʻu ʻŌʻō eastward at least as far as Highway 130. As of 8:30 this morning, the level of activity has decreased significantly, but it is too soon to know if this is merely a pause. 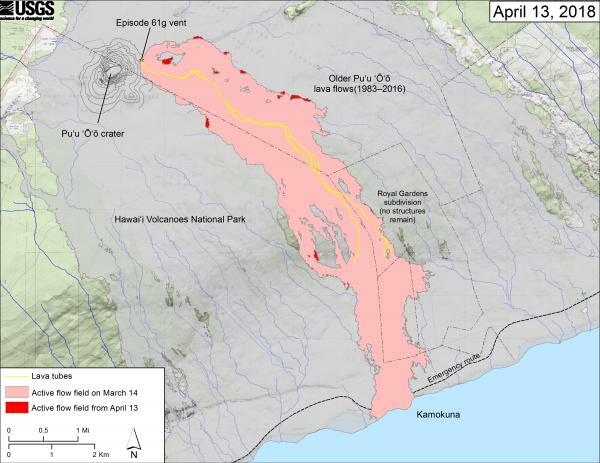 The intrusion began yesterday afternoon (April 30) associated with collapse of the Puʻu ʻŌʻō crater floor. The summit lava lake is unchanged and has risen overnight to just below the rim of the Overlook crater vent. Early this morning (May 1), HVO issued a Volcano Activity Notice calling attention to this intrusion and raising the possibility of a new outbreak along the rift zone if activity intensifies. Residents of lower Puna should remain on alert and monitor Hawai‘i County Civil Defense messages. Number of earthquakes per day during the past week, April 25–May 1, 2018, indicated by (blue bars. The red line is the cumulative moment (energy) release. USGS graphic. 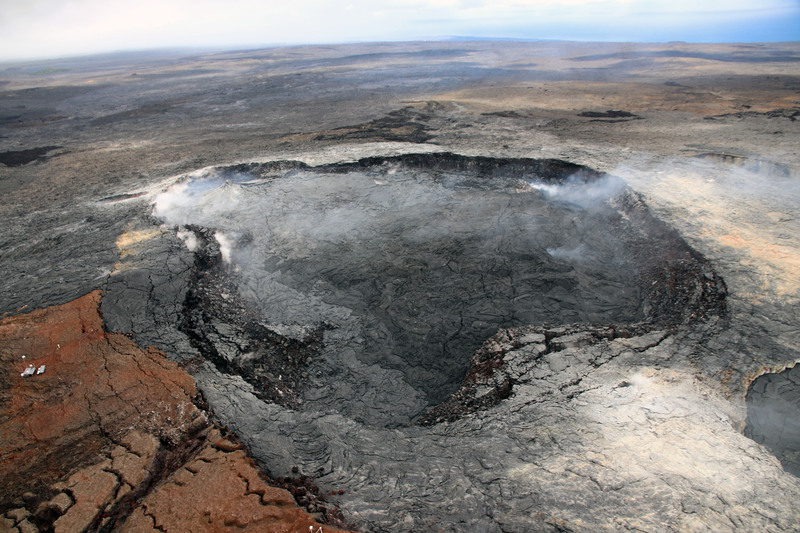 Summit Observations: The summit lava lake remains at a high level. 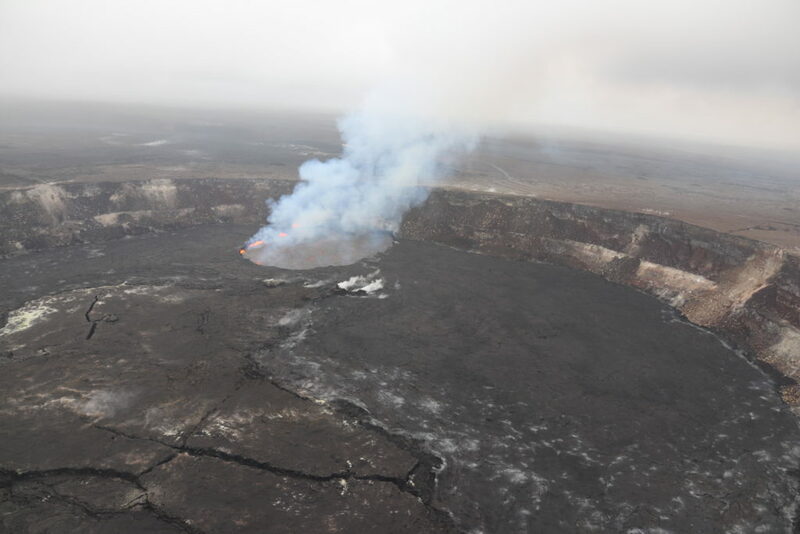 Overall, the summit lava lake has shown no response to activity in the middle and lower East Rift Zone. Summit tiltmeters recorded very little change overnight. Tremor amplitude is fluctuating with lava lake spattering. Elevated summit sulfur dioxide emission rates persist. Depth of earthquakes during the past week (April 25–May 1, 2018) in the area shown on the map above. USGS graphic. Puʻu ʻŌʻō Observations: HVO tiltmeters recorded sudden and dramatic changes accompanying the onset of crater floor collapse at Puʻu ʻŌʻō yesterday (April 30) between about 2 and 4 pm. Weather obscured web camera views of the crater, however thermal camera images showed the collapse in progress followed by emission of high temperature gases continuing into this morning. HVO field crews attempting to reach Puʻu ʻŌʻō this morning (May 1) were turned back by ash in the air above Puʻu ʻŌʻō, likely due to continuing collapse within the crater and vigorous gas emissions. Reddish ash was also noted in abundance on the ground around Puʻu ʻŌʻō. Seismicity remains elevated at Puʻu ʻŌʻō but tiltmeters near the cone show no significant deformation at this time. 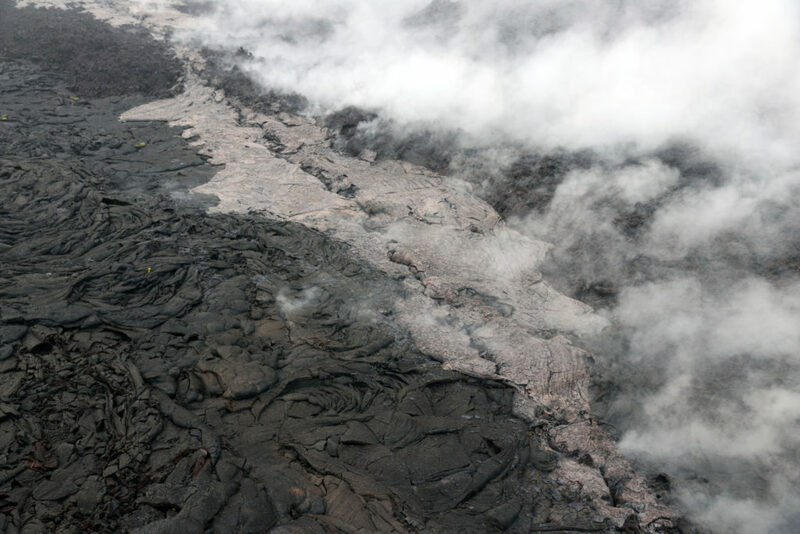 Lava Flow Observations: There is no lava flow activity from the 61g lava flow on the coastal plain or pali and no lava is flowing into the ocean. Lava flow activity continues on the upper flow field, above the pali and closer to Puʻu ʻŌʻō, and does not pose a threat to nearby communities at this time. Areas of the upper flow field with active lava flows are located within the Kahaualeʻa Natural Area Reserve, which has been closed to the public by DLNR since 2007 due to volcanic hazards. Webcam views of the flow field are available here. Maps of the lava flow field can be found here. For more information about the Kahaualeʻa NAR closure, go online. Lava Flow Field and Ocean Entry Hazards: Hazards of active or recent lava flows include, but are not limited to: hot lava surfaces that can cause serious burns upon contact with unprotected or exposed skin; rough, uneven, and sharp terrain that can lead to falls, abrasions, lacerations and other injuries; high air temperature and humidity that can lead to dehydration or heat exhaustion; and steamy ground-fog produced by heavy rain falling (sometimes with little warning) on active or recent lava flows; this steam can severely limit visibility, can be acidic and should be avoided. 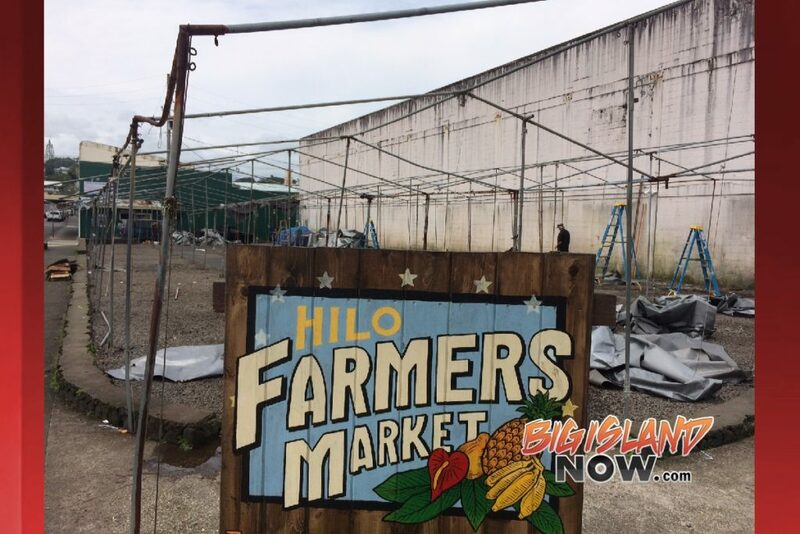 UPDATE 3, May 1, 10:30 a.m.
triggered increases in earthquake activity and deformation along a large section of the rift zone, according to Christina Neal, scientist-in- charge at Hawai’i Volcanoes Observatory (HVO). Neal said that seismicity was occurring as far east as Highway 130, and warned residents of lower Puna to remain alert and watch for further information about the status of the volcano at www.hawaiicounty.gov/active-alert. 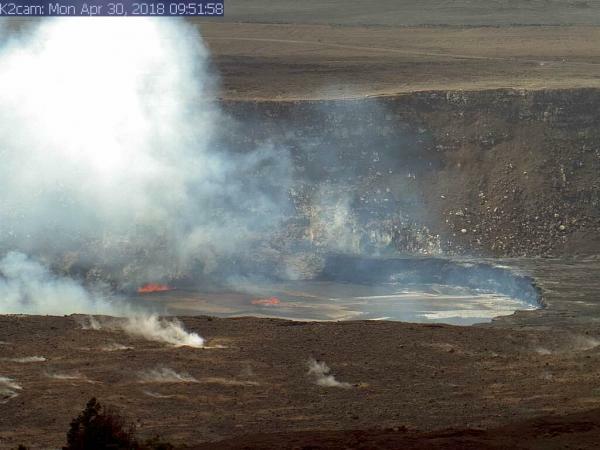 Meanwhile, Hawai‘i County has closed the Kalapana lava viewing area amid the possibility of an eruption, and security has been posted to ensure than no unauthorized persons enter the area. “We don’t want people hiking in that area, which is downslope from the rift,” Parks and Recreation Deputy Director Maurice Messina said. Messina said that vendors at the viewing area were told to vacate the area. He noted that the lava viewing area can draw 500 to more than 2,000 visitors, depending on the level of volcanic activity. A magnitude 4.0 earthquake just offshore of Puʻu ʻŌʻō occurred at 2:39 a.m. Tuesday, May 1, 2018—the largest of a sequence of tremors along the rift zone. There is no risk of tsunami at that magnitude. Deformation is the term used to describe change in the surface of a volcano, such as swelling, sinking or cracking, which can be caused by movements in the Earth’s crust due to motion along faults, according to the U.S. Geological Survey. UPDATE 2: May 1, 2018, 9:30 a.m. This is a Civil Defense message for Tuesday morning, May 1, 2018 at 9:30. The Hawaiian Volcanoes Observatory reports increased shallow earthquake activity in the Puna District below Kīlauea Volcano in the area between Puʻu ʻŌʻō and Highway 130. This means an outbreak of lava in a new location could occur. While it is not possible to predict where an outbreak could occur, the area east of Puʻu ʻŌʻō is a possible location. The Hawai‘i County Department of Parks and Recreation has shut down the lava viewing area in Kalapana due to the proximity to the increased hazardous activity. Lower Puna area residents are advised to stay informed by listening to the radio and Civil Defense text alerts and social media sites; this webpage will also be updated. ORIGINAL POST, May 1, 7:54 a.m. This means an outbreak of lava in a new location could occur. While it is not possible to predict where an outbreak could occur, the area east of Puʻu ʻŌʻō is a possible location. Due to the increased seismic activity, lower Puna area residents are advised to stay informed. Monitor Hawai‘i County Civil Defense messages here. On Tuesday, May 1, 2018, at 4:54 a.m. HVO reported that a collapse of the Puʻu ʻŌʻō crater floor Monday afternoon, April 30, on Kīlauea Volcano’s East Rift Zone has prompted increases in seismicity and deformation along a large section of the rift zone, with seismicity currently occurring as far east as Highway 130. A outbreak of lava in a new location is one possible outcome. At this time it is not possible to say with certainty if or where such an outbreak may occur, but the area downrift (east) of Puʻu ʻŌʻō is the most likely location, as this is where seismicity and deformation have been concentrated overnight. Between about 2 and 4:30 p.m. on April 30, following weeks of uplift and increasing lava levels within the cone, the crater floor at Pu’u ‘Ō’ō on Kīlauea Volcano’s East Rift Zone collapsed. Following the collapse, HVO seismometers and tiltmeters recorded an increase in seismic activity and deformation from Kīlauea Volcano’s summit to an area about 6 to 10 miles downrift (east) of Puʻu ʻŌʻō. Overnight, this activity localized downrift of Puʻu ʻŌʻō and continued to propagate eastward along the rift zone. The largest earthquake of this sequence so far was a magnitude 4.0 earthquake just offshore south of Pu’u ‘Ō’ō at 2:39 a.m. this mornin. The situation is rapidly evolving and USGS Hawaiian Volcano Observatory scientists continue to closely monitor Kīlauea’s East Rift Zone and summit. Hawaiian Volcanoes Observatories and Hawai‘i County Civil Defense are continuing to monitor the situation. More updates will be posted at BigIslandNow.com as information becomes available. For more information, email askHVO@usgs.gov. Mayor Harry Kim. Courtesy photo. UPDATE: April 26, 2018, 4:10 p.m.
experiencing chest pains early today. As of late afternoon on Thursday, April 26, there was no diagnosis, said Wil Okabe, the county’s managing director, who is serving as acting mayor while the mayor is on sick leave. The mayor has been undergoing tests, and was not accepting visits for the time being. “We want to respect his privacy and let him rest as we wait for the doctor’s determination on what the next steps are,” Okabe said. 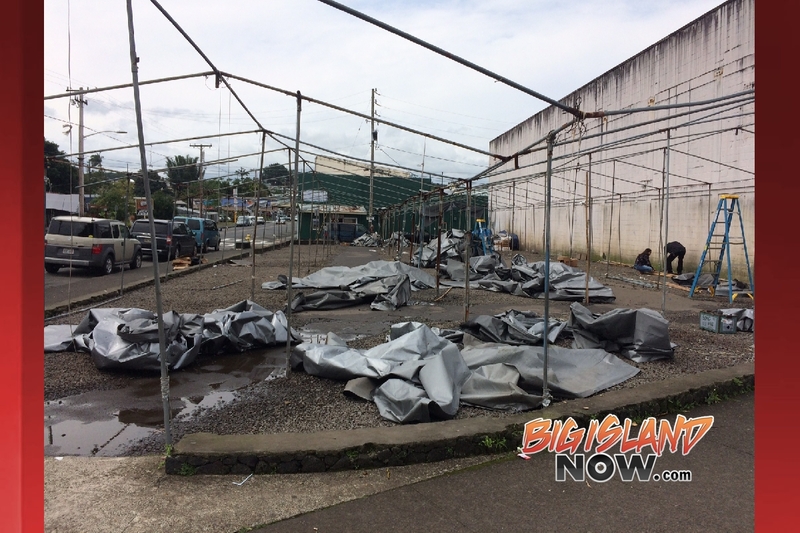 The 78-year- old mayor drove himself to Hilo Medical Center around 4:30 a.m. and proceeded to call Okabe and other staff to notify them of the situation. 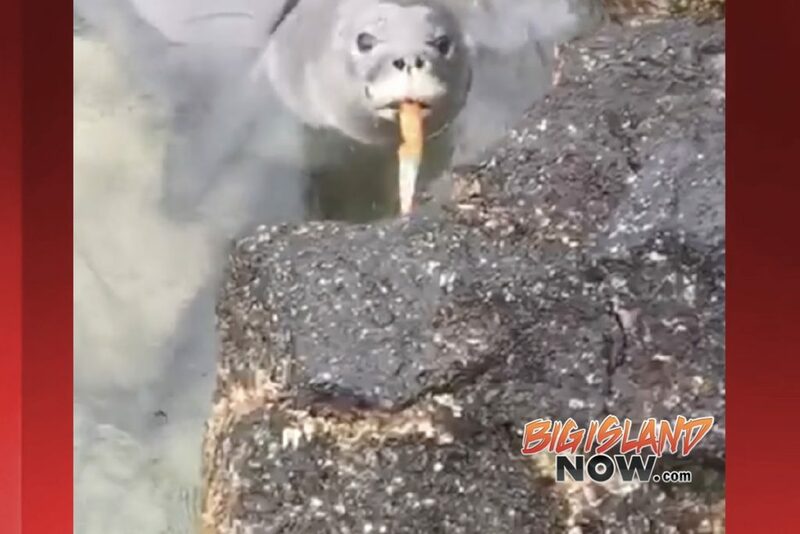 He was medevaced to O‘ahu around 6:45 a.m. The mayor has had three previous heart attacks, and underwent quadruple bypass surgery in 2008. 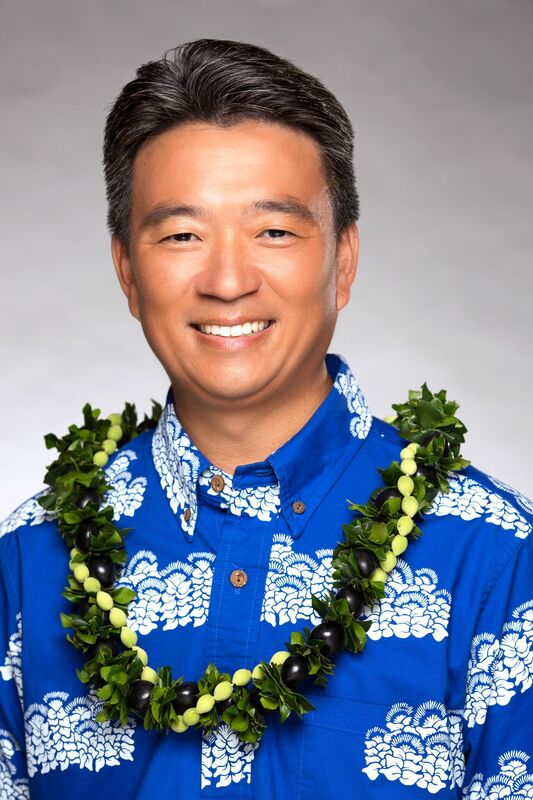 ORIGINAL POST: April 26, 10:18 a.m.
Hawai‘i County Mayor Harry Kim has been medevaced to The Queens Medical Center in Honolulu as a precautionary measure after experiencing chest pains early Thursday morning, April 26, 2018, according to a press release from his office. 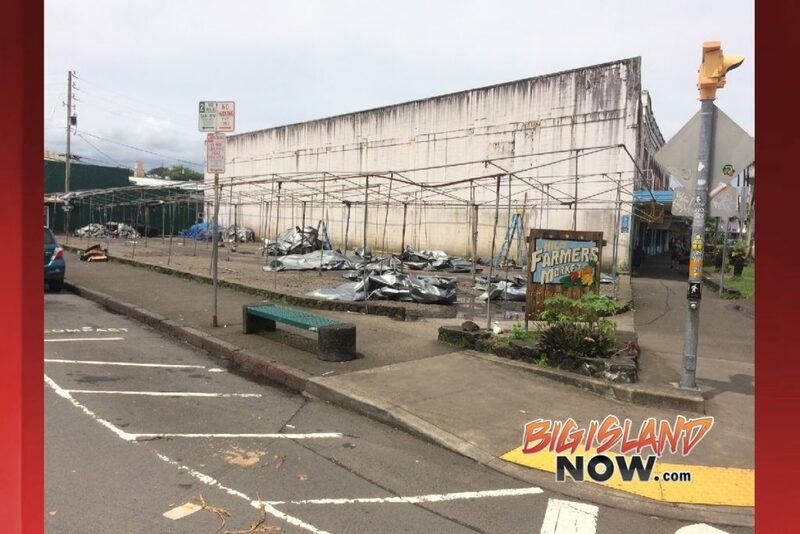 The 78-year-old mayor drove himself to Hilo Medical Center around 4:30 a.m. and called Managing Director Wil Okabe and other staff to notify them of the situation. He was medevaced to O‘ahu around 6:45 a.m.
Okabe will serve as acting mayor while the Mayor Kim is on sick leave. An emergency meeting of the county department heads and executive staff was held to inform everyone of the situation. 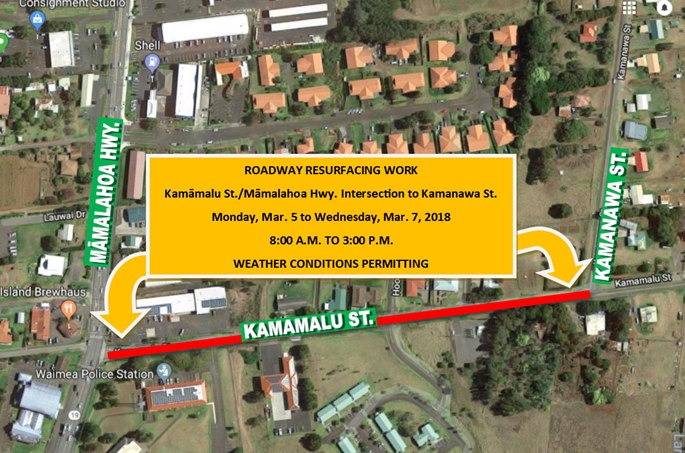 The County Highway Maintenance Division will begin resurfacing work on the Kamāmalu Street roadway from the intersection with Māmalahoa Highway to the Kamanawa Street intersection on Monday, March 5, 2018, and is estimated to be completed on Wednesday, March 7, 2018. Working hours are from 8 a.m. to 3 p.m., weather and construction conditions permitting. Motorists are advised to expect delays and to drive with caution as heavy vehicles and machinery will be in the work zone. Alternating lane closures will be in effect and at a minimum, one lane of travel (for two-way traffic) will be provided through the construction area. 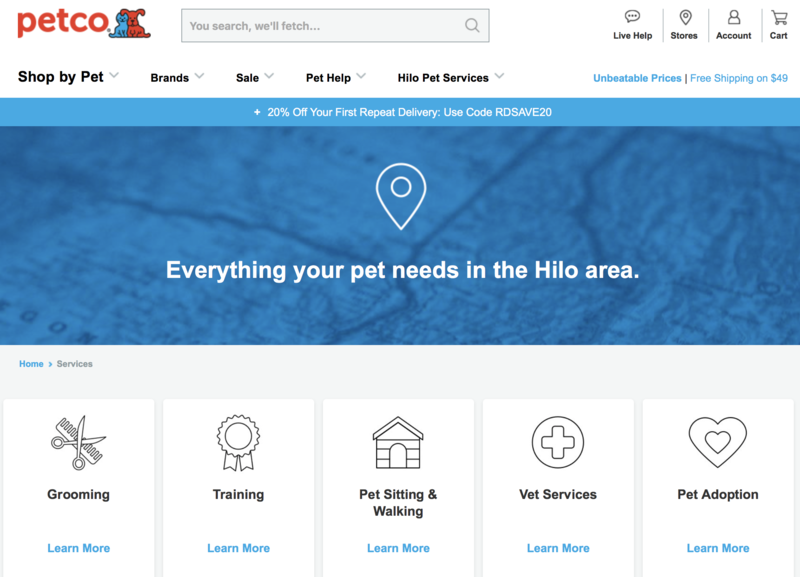 If there are any questions or concerns, contact Barett Otani, Information and Education Specialist at (808) 961-8787. 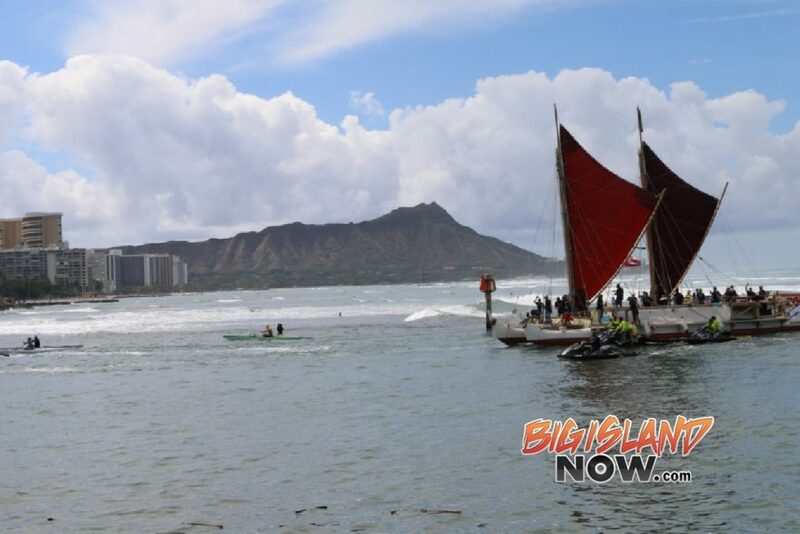 For the first time in Hōkūleʻa’s 42-year history, the legendary canoe will sail into the waters of Pearl Harbor and visit the Puʻuloa region. 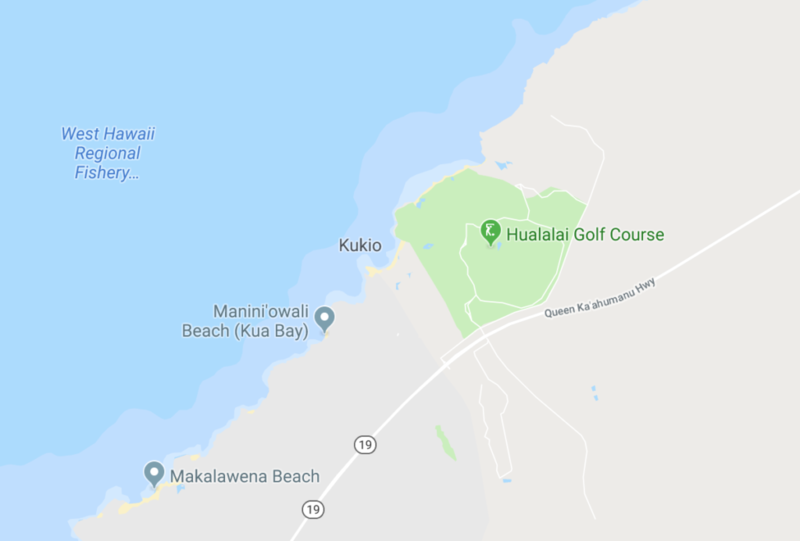 The crew will be welcomed at Rainbow Bay Marina on Saturday, Feb. 10, at 10 a.m. by the Puʻuloa community and US Navy who are hosting the canoe. The week-long engagement to follow will include school visits, public dockside tours and a crew talk story event. As part of the Mahalo, Hawaiʻi Sail, the purpose of Hōkūleʻa’s visit is to bring the canoe to more of Hawaiʻi’s children, honor Pearl Harbor’s ancient culture and history, and to learn about the efforts to restore the area’s cultural sites including Loko Paʻaiau Fishpond. When Hōkūleʻa enters the waters of Pearl Harbor for the first time on Saturday morning, the crew will pay respects as she sails by significant cultural and historical sites including Halealoha Halemau (Fort Kamehameha Reburial Platform), USS Nevada, Arizona Memorial, Battleship Missouri, Ford Island, USS Utah, and Loko Paʻaiau Fishpond before making her arrival at Rainbow Bay Marina. The crew also will spend a day working with the restoration team at Loko Paʻaiau Fishpond on Saturday, Feb. 17. The Loko Paʻaiau fishpond is located at McGrew Point Navy housing and is one of only three fishponds out of an original 22 in the Pu’uloa area which are still relatively intact. In September 2014, the Navy invited members of the local Hawaiian civic clubs and ʻAiea community members to begin work on restoring the historic fishpond. 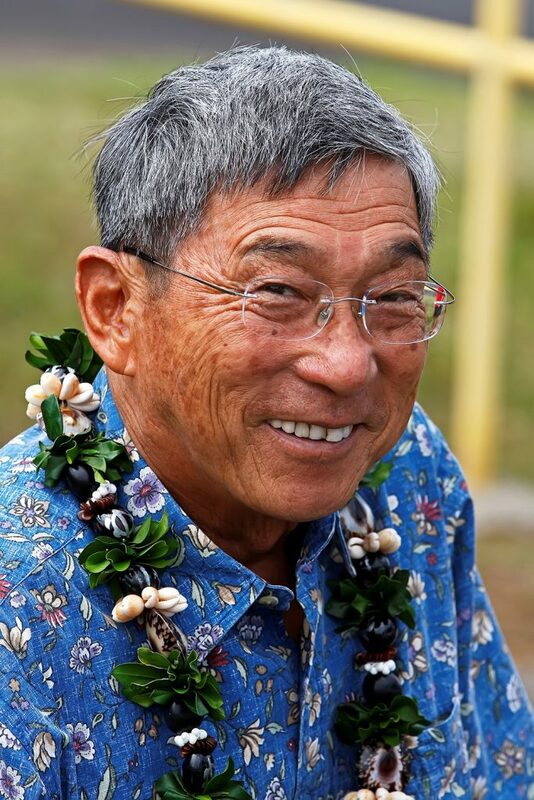 “We want to celebrate this place and the movement taking place by the Puʻuloa community and the Navy to restore the Native Hawaiian history, sites and cultural identity of Pearl Harbor,” said president of the Polynesian Voyaging Society Nainoa Thompson. “We hope Hōkūleʻa’s visit will open the doors for our young people to learn about the extraordinary history and culture of this very special, sacred place,” he added. More than 1,000 school children are scheduled to visit Hōkūleʻa and participate in educational activities during her stop at Puʻuloa. Hōkūleʻa will be greeted at Rainbow Bay Marina with traditional Hawaiian protocol and a military welcome. The event is open to the public and $1 parking will be available at Aloha Stadium. Attendees are encouraged to bring their own lawn chairs and water. Hōkūleʻa will be open for public dockside canoe tours on Sunday, Feb. 11, 10 a.m. to 5 p.m., and Monday through Friday, Feb. 12, through Feb. 16, 3 to 5 p.m.
On Thursday, Feb. 15, 5 to 7 p.m., the public is also welcome to attend a Hōkūleʻa talk story event featuring crew and community members who will discuss the significance of Hōkūleʻa’s visit to the Puʻuloa to Ewa region. “We want to thank the Puʻuloa community, Aliʻi Pauahi Hawaiian Civic Club, Kapolei Hawaiian Civic Club, Pearl Harbor Hawaiian Civic Club, the US Navy and Kamehameha Schools ʻEwa Region for inviting Hōkūleʻa to visit Puʻuloa to learn more about the great work and rich history in this cultural location and allowing us the opportunity to connect with more schools in this region,” said Thompson. Below is a schedule of events for Hōkūleʻa’s Pearl Harbor/Puʻuloa visit, an official stop on Hōkūleʻa’s Mahalo Hawaiʻi, Sail. For the most up to date information, visit online. Saturday, Feb. 10, 2018, 10 a.m.
Hōkūleʻa and her crew will arrive at Rainbow Bay Marina and will be greeted with Hawaiian cultural protocol followed by a military welcome. Representatives of Hawaiian Ethos have been invited to a Waimea Community Association (WCA) Town Meeting on Thursday, Feb. 1, 2018, at 5:15 p.m. to provide an overview of their plans to cultivate and dispense medical cannabis to Hawai‘i Island patients. 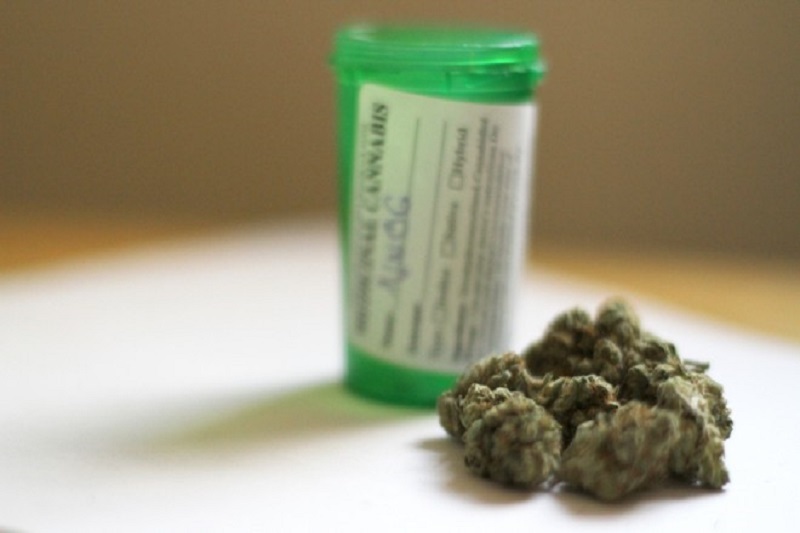 Medical cannabis has been legal in Hawai‘i since 2000, but access to medical cannabis was challenging. Initially the Hawai‘i law enabled patients and caregivers to legally grow their own plants within certain parameters. Then in 2015, the State Legislature passed and the Governor signed into law Act 241, which became codified as Chapter 329D of the Hawai‘i Revised Statutes, to establish a dispensary licensure program to make medicinal marijuana products readily available for registered patients while balancing the health and safety of patients and the public. Today in Hawai‘i, eight licensees have received permission to operate dispensaries for licensed medical cannabis patients. 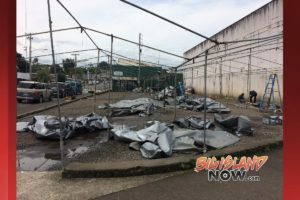 Two such licensees have been authorized for Hawai‘i Island – including one group that will source its flower from Waimea. One of the companies, known as Hawaiian Ethos, has plans to open their first dispensary in Kona in the Spring and a second dispensary in Hilo later this year. Both dispensary locations will offer the full range of products that are allowed by Hawai‘i State regulations including flower, tinctures, tablets and capsules in a variety of dosages. The Hawaiian Ethos team is led by Interim CEO Luis Mejia and COO Zachary Taffany. Representatives of Hawaiian Ethos have been invited to a Waimea Community Association (WCA) Town Meeting on Thursday, Feb. 1, 2018, at 5:15 p.m. to provide an overview of their plans to cultivate and dispense medical cannabis to Hawaii Island patients. The Hawai‘i State Department of Health’s Office of Health Care Assurance has regulatory responsibility for Hawai‘i’s dispensary licensure program to ensure patient safety, public safety, and product safety and to ensure licensee comply with state law. This includes statewide oversight of the laboratories that test the safety and quality of the cannabis and manufactured cannabis products, and onsite inspections and monitoring of licensed dispensaries that grow, manufacture and sell medical cannabis products to qualifying patients. There is no charge to attend the meeting although membership in the association is urged and dues for 2018 are due. Annual WCA membership is $15 for individuals and $25 for families, and because the organization is a not-for-profit, dues are tax deductible to the extent permitted by law. 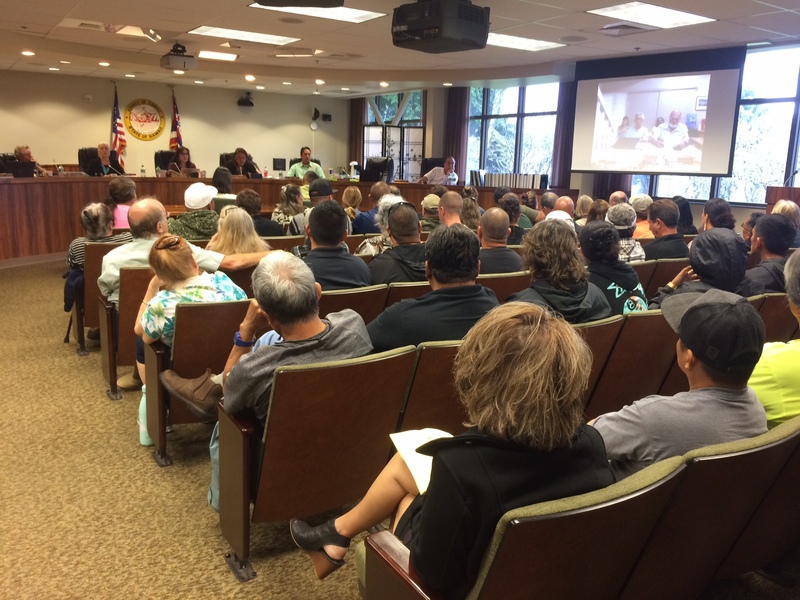 The program will begin with Hawai‘i County council members providing an update on council business and Community Policing Officer Kelena Ho‘okano reporting on recent incidents and community safety concerns. 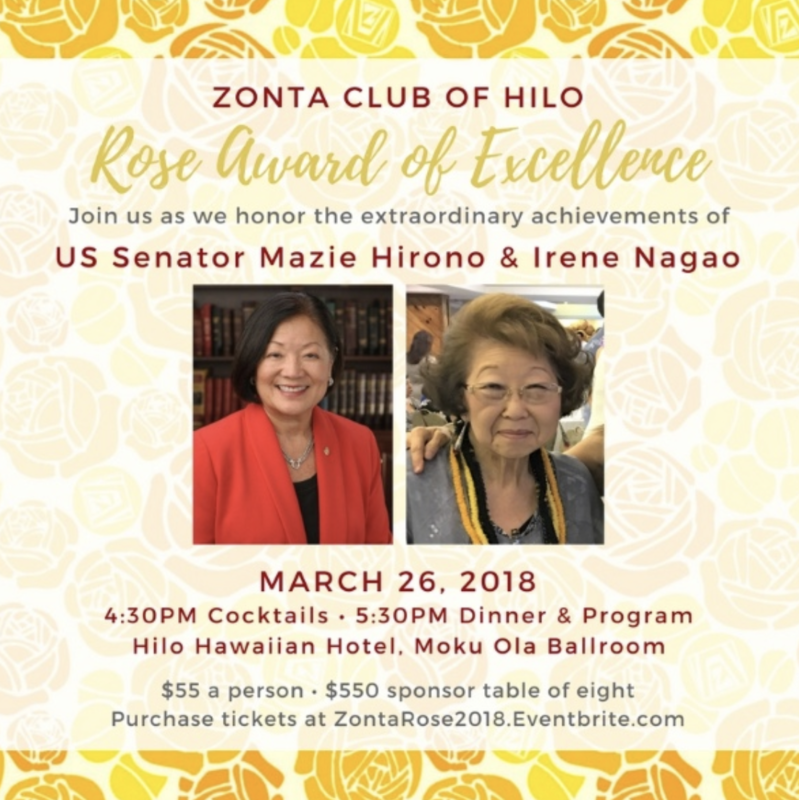 The spotlighted community non-profit for the evening will be North Hawai‘i Community Hospital’s much needed emergency room expansion project which seeks to raise about $1 million from the local community to be matched with $24 million from other public and private sources, including $1.5 million from the 2018 State Legislature. As has become a monthly custom at town meetings, attendees will be encouraged to make a tax deductible donation to this not-for-profit organization. Starbucks will provide steaming hot coffee and the association board will provide cookies. The meeting will be located at the Waimea School cafeteria, 67-1225 Mamalahoa Highway in Kamuela. 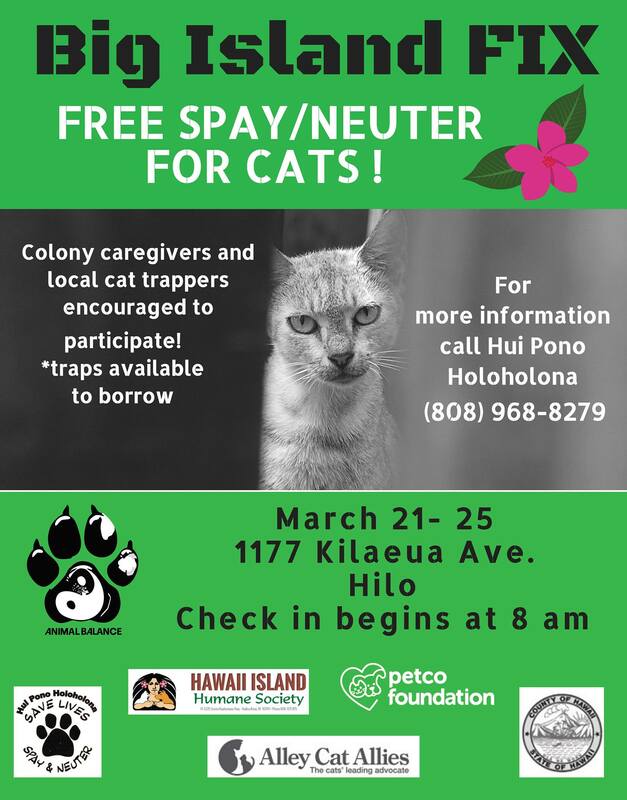 For more info see the website, Facebook, or call Patti Cook at (808) 937-2833 or email cookshi@aol.com.